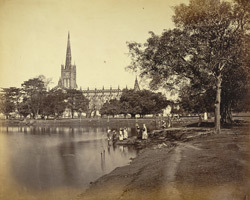 Photograph from the Vibart Collection, of the Cathedral at Calcutta taken by an unknown photographer about 1865. The 'Indo-Gothic' Cathedral, completed in 1847 and designed by Major Forbes of the Engineers, was the first of its type to be built in India. It contains murals, frescoes and a stained-glass west window designed by Sir Edward Burne-Jones.